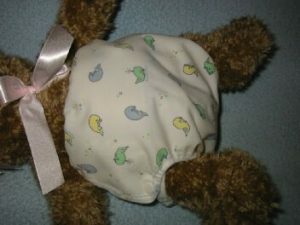 Nighttime cloth diapering is quite a bit different from daytime diapering as you will generally be leaving your baby in the same diaper for up to 12 or 13 hours. The name of the game here is absorbency. 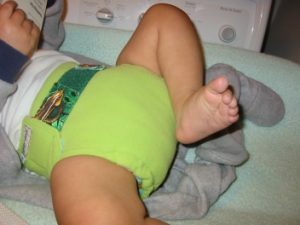 Most babies do fine with double diapering, but this can be quite bulky, and there are the so-called “super soakers” that can outpee even two prefolds. My kids were not super heavy wetters, so I’m just going to explain what we tried using. We never had a leak with any of these combinations and I mean no wetness at all outside of the cover. If we had, I’m sure we would have switched back to disposables. 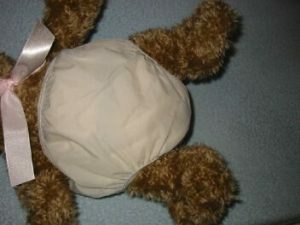 I *hateed* changing crib sheets (it’s such a pain), so any leaking was unacceptable. 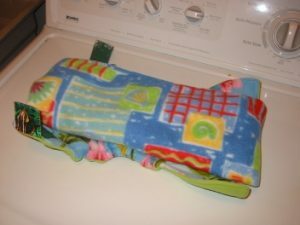 The system I ended up using from the time I discovered it through potty training for both kids was homemade fleece pockets with Windpro covers. I have instructions for the DIY pockets here. This system was super-absorbent, breathable, didn’t leave red marks and kept the kids’ skin perfectly dry all night. This is a basic nighttime combo that you usually don’t have to buy anything extra for. It’s bulky, but not excessively so. And it worked on my toddler just fine on 12 hour overnights. 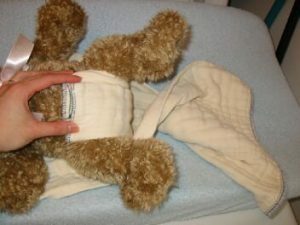 First, trifold the infant prefold along the stitching, then lay it on top of the premium prefold. Then bikini twist the larger prefold underneath it and pin in place. 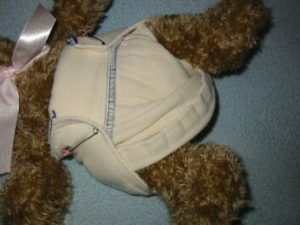 The bikini twist is a really good fold to use here because it cuts down the bulk between the baby’s legs where the doubler already is. If this still isn’t enough absorbency, you could try a regular or a premium prefold. Try folding the doubler prefold in thirds, or laying the doubler prefold down flat and just folding the front in thirds. This is basically the same idea, but rather than using a second prefold, you can use a dedicated doubler. Doublers are usually made with super-absorbent materials like hemp or bamboo. So this is a little trimmer than using two prefolds. The idea is just the same. 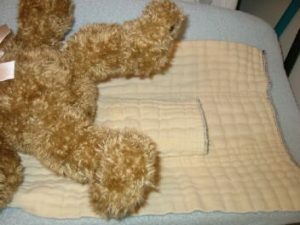 Lay the baby down, place the doubler on top of the prefold, and do the bikini twist. 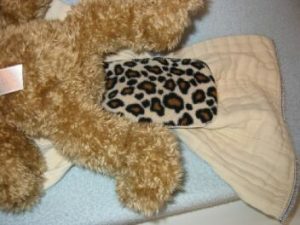 Little Fancy Pants offers some super absorbent bamboo fleece doublers. For either of these systems, I had the best luck with Dappi pull-ons and Motherease Airflows. 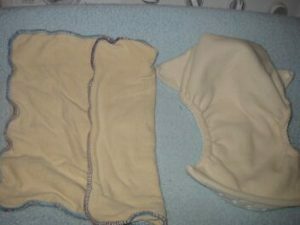 Even if the diapers got totally saturated, neither of these covers let any dampness out onto pajamas or sheets. The Airflows have the advantage of allowing a little air circulation between the snaps. 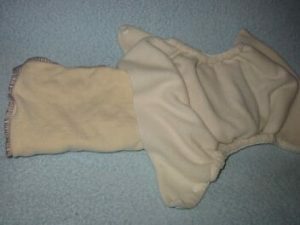 I happily used this system on my daughter for months, but eventually decided I wanted something else 1) because if my husband or a babysitter put her to bed, they had to use disposables, and 2) I didn’t like that her skin was soaking in so much wetness in the morning. 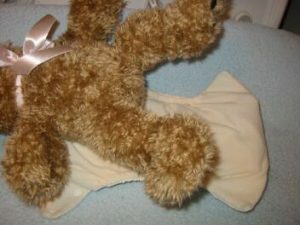 So I bought Fuzzibunz (FB) and used a thick hemp jersey flat as a stuffer. The hemp flats are *extremely* absorbent and I didn’t need to use any doublers with them. 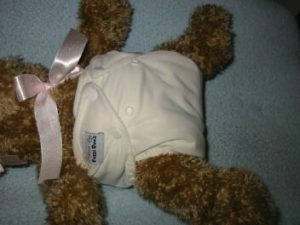 The Fuzzibunz are nice because the fleece wicks the wetness away from my babies’ skin and since I pre-stuffed them, my hubby and our babysitter could put them on with no problems. I just folded the flat into thirds, stuffed it into the FB pocket, and put the diaper on. Easy as pie. 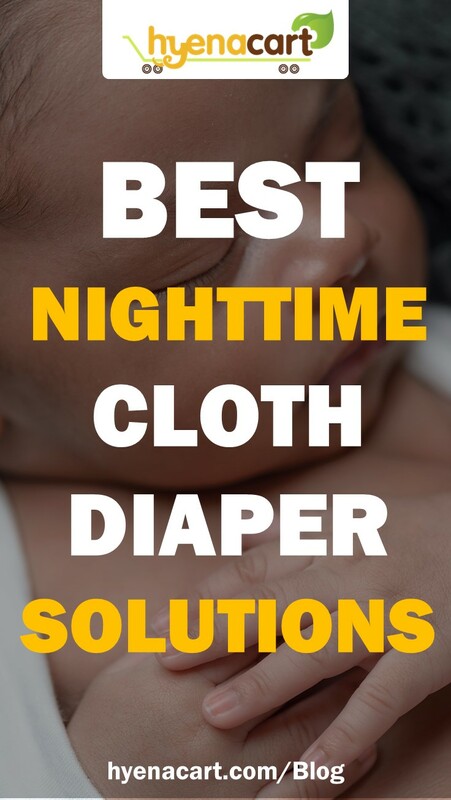 Once you find the right absorbency for your child, cloth diapering at nighttime to be leak-free, simple, and affordable. It might take a bit of experimentation, but you should be able to find something that works for you!